Tutti gli oggetti riportati in questo annuncio sono funzionanti. L'aiutante perfetto non solo nel giardinaggio, ma anche nell'edilizia o nel tempo libero. Si presta infatti a essere un attrezzo outdoor prezioso in campeggio, ad esempio. Tipi di Attrezzi Attrezzo multifunzione. Il manico di ricambio è adatto a mazza o scissione ascia. Bagno / sanitari. Giardino / attività sportive. Utensili pneumatici. Power Tools. Sfoglia le nostre categorie. Sezione trasversale del gambo: circa 44 x 32 mm. 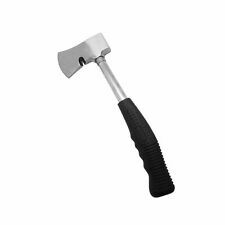 The Hultafors Chopping Axe is suitable for small-scale tree felling and manufactured in blasted and clear lacquered ironwork. The wooden handle is curved and made of hickory and is treated with linseed oil. Hilka Pro-Craft. Useful for breaking up hard soil in the garden or anywhere else. Hickory handle. Double ended. Size: 12 1/2" x 10" (from tip to tip) or 320mm x 255mm. Stubai Ascia Mano Sinistra laterali, per Verde Lavorazione del Legno ecc. Stubai Left Handed Side Axe. Edge is approx 120mm, weight 900gms. One-piece solid forged construction, fully polished and with leather grip. Length of cutting edge is 3.1/4in. Handle: Leather. find your tool. However, delays are occasionally inevitable due to unforeseen circumstances. 915mm pick axe shaft, made from high density polyethylene covered fibreglass. The fibreglass core contains 60% continuous unidirectional and longitudinal glass fibres. Attached with a soft grip rubber handle. 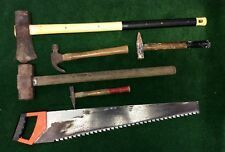 Axes Up To 6lb (2.72kg). $---The ulimate force in splitting logs. ---Made from Cast Iron hardened and tempered ---Diamond shaped cross section provides splitting of the log in 4 directions. ---Spherical striking face to provide centered and efficient blow. ---Notches to prevent pop out from the log being split. ---Sharp point for easy start. ---Use with a sledge hammer for greatest effect. ---Total length of item: 17cm ---Weight: 1.5kg. Tough, diamond-shaped wood splitter. Spherical striking face for a centred blow. Sharp point for easy insertion and notched to prevent pop out. Finish Painted. Issues With Your Order?. Splits logs in 4 directions. Lambda Sensors. Lambda probes & sensors. Glow Plugs. Lucas Glow Plugs. NGK Glow Plugs. Bosch Glow Plugs. Champion Glow Plugs. Denso Glow Plugs. Axes Up To 6lb (2.72kg). Wooden wedge with 2 x galvanised steel rings for fixing a wooden handle into an axe head. See Silverline website for full details. Fair wear and tear and consumable products are not covered. Manufactured to BS3823 BW/BR standards specification. Various lengths and eye sizes available. Length: 600mm (24in). Length (cm,in,mm,m): 600mm. However, delays are occasionally inevitable due to unforeseen circumstances. Compatible with axes up to 6lb (2.7kg). Wooden wedge with 2 x galvanised steel rings for fixing a wooden handle into an axe head. Not suitable for fibreglass handles. Four Stroke. If you recently placed an order and you're wondering why you haven't received it yet then you are at the right place, this page is designed to help you get your order as soon as possible. Arbre à hickory à grain droit poncé et ciré, fourni avec la cale n ° 1 Convient pour le marteau de peintre de balle - 225g (8oz) et les marteaux Joiners (ou Warrington) - 280g (10oz) ou 340g (12oz). Affichage emballé Longueur de 30cm . Manufactured to BS3823 BW/BR standards specification. Various lengths and eye sizes available. Length: 915 x 92mm (36in x 3.5/8in). Eye Size (mm): 92 x 24. However, delays are occasionally inevitable due to unforeseen circumstances. Gloves & Safety Masks. Cylinder Head Removal Tools. Spanners- Flex Head. Top Rated Tools is a tool supplier based in North Yorkshire, and has been an online presence since 2003. Thread Repair Kits. Exhaust Repair. Altro: Con Il fodero di nylon. larghezza della lama: 8.8 cm. durezza: 56HRC. materiale lama: 440C. 1 x Fiskars Splitting Axe X37. The ironworks at Antskog were founded around 1630, and Billnäs followed in 1641. Blackspur 5lbs pick axe manufactured with a 900mm length glass fibre shaft with comfortable shock absorbing rubber grip and black painted drop forged head. Supplied in colour label. One of the most comprehensive ranges of hand tools and DIY associated products in the UK. Faithfull hickory axe handle.A Fawn foot pattern axe handle made from top grade hickory.Various lengths and eye sizes available.Length. 36 x 2.1/2in. Faithfull wooden handles are made to BS3823 BW/ BR british standard specification. Martello Forgiato lavorazione del legno, Woodcarving dritto ASCIA, Ascia con Artiglio ASCIA.